This has been a monumental week here at Proof. We’ve grown our team 50%, moved our HQ to Austin, TX, and today we launched two new product features live on your dashboard. Has your email form, landing page, or CRM ever broken and caused you to lose leads? If it has, it’s a scary place to be. Luckily, you’ll never face this hair-pulling moment again! Now with Proof’s Export Leads feature, you can download a .CSV file with the 10,000 most recent leads captured from your campaign. This CSV not only contains the email address of your leads but also enriched leads profiles. You’ll be able to see data such as the lead’s name, location, gender, browser, OS, and whether or not a lead is a first-time visitor! Expert use case: Upload your .CSV to Facebook and create a Lookalike Audience. When you target a Lookalike Audience, Facebook will show your ad to other people who are likely to take similar action! 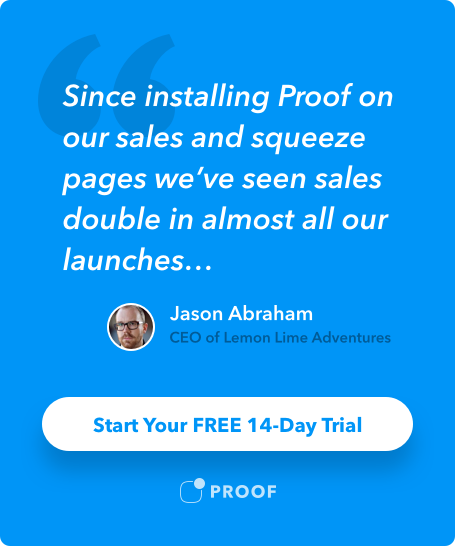 Proof is designed to increase both your leads and sales. Our newest feature takes that mission even further. In our new update, you can set a Destination URL that gives you full control over where to send your visitors when they click on a Proof notification. Expert use case: On your home page, use Hot Streaks to show how many people have signed up in the last 24 hours. For ultimate conversion power, set the destination URL to take visitors directly to your signup page to create their own account! What’s coming up next at Proof? What products & features would be most helpful when setting up Proof? Are there more ways we can help you convert visitors to leads (and eventually customers)? Do you need any other ways to report on your conversion performance? Hit ‘Reply’ and let us know—we read every comment!